It is a friction knot (or slip knot) meaning that it will self-tighten around the object it is tied to when loaded. Though it is sometimes referred to as the blood knot, the tying process is dissimilar. It can be tied to leather and paracord. The stopper knot has good strength. It is the knot of choice for closing a belay system and preventing the rope end from accidentally feeding through the belay device. Sliding barrel knot – Instead of a single line of rope, the turns are made on the circumference of a loop. The ends are tightened similarly as above. It is an adjustable knot. Barrel knot on a bight – The working end is wrapped around a bight instead of a single strand of rope as shown above. A carabiner or fishing swivel can be attached to the loop so formed. 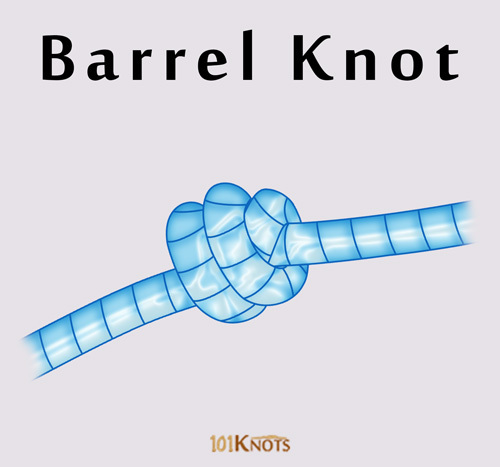 It is also known as the improved barrel knot. Barrel bead knot – It is longer with more turns. Used for decorative purposes. 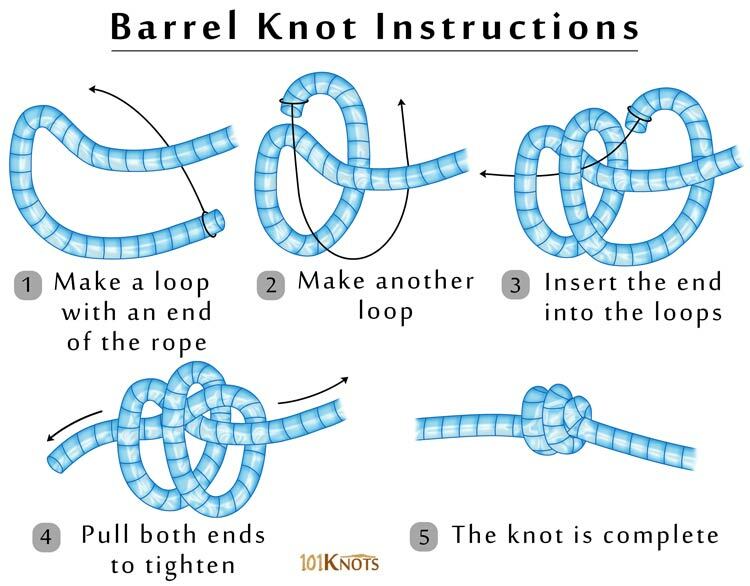 If you are making it with 3 turns, you may refer to it as the triple barrel knot. Tying Sperry Top-Sider shoelaces (for duck or bean boots, boat shoes). Here it can be used as a tassel knot. Making an ascot or cravat. For cow’s tails in caving (the form used here is sometimes called the barrel noose). For safety in rescue operations.